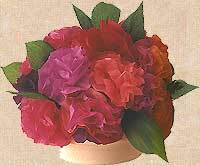 Choosing tissue paper in closely graded colors for these flowers achieves the vibrant, glowing quality of real live peonies or roses. You can vary the diameter of your paper circles, with 7.5 cm/ 3 inches being about the smallest workable size. Cut circles of tissue paper. Fold them into quarters and flute the edges using scissors. Stack 4 or 6 circles of tissue paper together. Bend a small loop in one end of a length of florist's wire. Use a needle to make a hole in the center of the paper circles, then thread the straight end of the wire through from front to back. Turn the paper over and gently bunch the circles up around the wire loop. And wind the wire around the base of the flower at the back to secure. Gently ease the tissue paper into attractive 'petal' shapes at the front. Cut leaf shapes fro crepe paper in proportion to the flower heads. Although crepe paper is stiffer than tissue, do not make them too large, or they will flop. Bend small loops at one end of lengths of florists' wire and attach the leaves singly or in pairs. Finally arrange the finished flowers and leaves in a bowl.